Those of you who are on Twitter may have noticed the #bookaday hashtag this month. Started by @boroughpress, it's a 30-day challenge to share a book a day. As you'll have noticed, I have far too much to say about books to keep to a 140-character tweet per day, so I've decided to use my blog for the challenge instead. Here's the first entry. I read a lot as a child. No, really, I mean a lot. Imagine how much a really obsessive child reader would do, and then double it. Right, well, I can pretty much guarantee you I still did a lot more reading than that. Consequently it's almost impossible for me to choose a single book as my childhood favourite - there were so many I loved, and I had different favourites at different ages. The Chronicles of Narnia by CS Lewis were (and are) a literary love of mine, so much so that all seven books in my boxed set fell apart. Goodnight Mr Tom by Michelle Magorian was another favourite, and along with Richard Adams' Watership Down, was one of the first books to move me to tears. However, for the purposes of this challenge I'm going to choose one my all-time, long-standing most bestest books ever, Danny the Champion of the World. 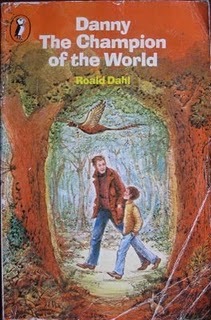 I was a huge Roald Dahl fan when I was little, and loved all his books, but Danny the Champion of the World always stood out for me and I must have read it from cover to cover scores of times, and I certainly re-read my favourite chapters far more often than that. It's quite different from Dahl's other children's books. There are none of the larger-than-life fantasy elements of, say, James And The Giant Peach or Charlie and the Chocolate Factory. There are no talking foxes here, no witches, no magic homemade medicines, no giants. What we do have is the story of a father and son, who live alone in an immaculate little caravan next to their filling station and garage, hatching a large-scale pheasant poaching plot to get their own back on the odious landowner Victor Hazell. Their ingenuity when it comes to the poaching is highly entertaining - like Fantastic Mr Fox, it often feels like a sort of rural heist movie - and tickled me no end when I was a kid. However, the real heart of the book is Danny's relationship with his gentle, intelligent father. Danny's dad William is absolutely, and rightly, his hero - but most touchingly, it's clear that Danny is William's hero too. My favourite part of the story when I was a child was the chapter in which William has gone missing in the middle of the night, and Danny, who knows full well that his father would never abandon him unless there was something badly wrong, takes it upon himself to drive a customer's car into the dark, deserted woods to go and rescue him. Like all Dahl's books, there are some dark moments. At one point, Danny is caned by his bullying teacher, leaving his hand painfully injured. The whole incident is described in chilling detail that shocked me greatly as a child. When I was slightly older I read Boy, Dahl's memoir of his own school days, in which he rails against the teachers who beat him during his boarding school years, and came to understand the outrage that practically emanates from the page when Danny is punished by Captain Lancaster. Despite these occasional undercurrents of cruelty characteristic of Dahl's work, and indeed the fact that the whole plot hinges around Danny's father involving his son in plotting a crime, there is an odd innocence and charm to Danny the Champion of the World, a sort of cosiness that I found greatly reassuring as a child. The simple pleasures of Danny's life - beans on toast, for instance, or flying a homemade kite - and the unconditional admiration and trust he and his father share, imbue the story with warmth, and Dahl's gift for giving villains the comeuppance they deserve is, as always, greatly satisfying.